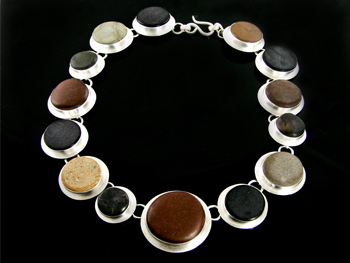 Circular beach pebbles selected by Amy to make this a striking piece. Made from recycled silver. In Her Own Words �I love simplicity, color, light, subtle texture and the mysterious connection that art has to nature. As a visual person I am always looking for inspiration from both the natural and urban environments.� �I love finding objects, such as beach and bottle glass with hints of writing or design or gorgeous smooth pebbles. Cutting them into specific shapes they resemble gemstones and take on a new precious quality.� About the Artist Amy started her jewelry business 25 years ago after graduating from SUNY New Paltz, NY with a BFA in Metalsmithing. Working in the jewelry arts allows her to think sculpturally, graphically and painterly, while satisfying her desire to make things with her hands. Amy uses recycled glass and ceramics such as glass from vintage Coke Bottles and shards from broken plates and vases to create elegant and highly wearable jewelry. Amy�s jewelry is sold to fine galleries, boutiques and museum stores throughout the USA and abroad. Additionally, the mining of precious metals such as silver and gold is extremely destructive to the environment. To counter this Amy purchases silver and gold from a company that only uses precious metals that have been reclaimed, meaning, not newly mined. Amy believes that we all have a responsibility to maintain our planet�s beauty and integrity; and in doing so takes great care in making sure that her business is as eco-friendly as possible. Amy feels compelled to educate as many people as possible to increase awareness to the fact that there are more and more eco-friendly options when it comes to buying and making jewelry. She also encourages the use of non-toxic and biodegradable options in both daily life and business.